The first was the “boost” or dual-mode feature that provides an output boost, great for changing volumes at the click of a foot switch. The second was the Variable Dynamic Control (VDC) that adjusts the reactance between the attenuator and speaker, essentially acting as a high-cut filter. The third was the weight of the attenuator, which is less than half the weight of a PRX unit. As soon as I finished writing the article, I went out to my man-cave and started messing around with the unit that Jeff let me borrow. Man, I was giddy. This thing works great! In any case, I got ambitious and decided to do some quick demo clips demonstrating the first two features: Boost and VDC. One thing that I forgot to discuss in my first impressions article was weight reduction. The reason why this unit weighs so much less than the PRX is due to the lack of a huge transformer. But that loss of weight comes at the price of a little flexibility. The transformer in the PRX allowed you to use different amp and cab impedance combinations. The DRX has variable impedance from 4 to 16 ohm, but your amp and cab impedance settings have to match. For me, that’s not a big deal because though I have cabs that are either 8 or 16 ohm, all my amps have output jacks for those impedance settings. But the features that this unit bring to the table make that particular issue almost irrelevant. In this clip I’m playing a single-chord riff, and switching in and out of boost mode without changing the way I’m playing. My “normal” mode attenuation is down about -20dB, while boost mode is probably around -14-17dB. It’s an analog sweep, so it’s tough to get the exact numbers. The idea behind this was to demonstrate the increase/decrease in volume but not gain, which would have changed my tone due to compression. As I mentioned above, VDC adjusts the reactance between the attenuator and speaker, essentially acting like a high-cut filter (though there are no filter caps). In this clip, I’m going between full-reactance (no cut), to the maximum setting, which is four clicks left on the five-position rotary switch. You won’t notice a stark difference between the two, but when I play at the maximum setting, the real high frequencies get cut off, due to the slightly lower dynamics. Like I said, it’s a fairly small, but noticeable difference. 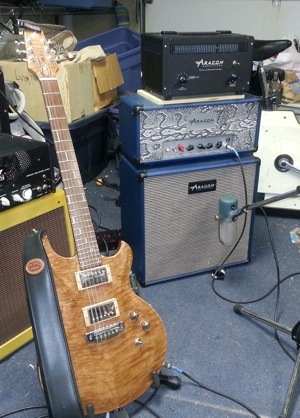 For that particular amp, just moving it over one position tamed my tone just fine. But I wanted demonstrate by going to the extremes. I believe this will be particularly useful at gigs to get just the right amount of bite without feeling as if my tone is slicing. So there you have it. 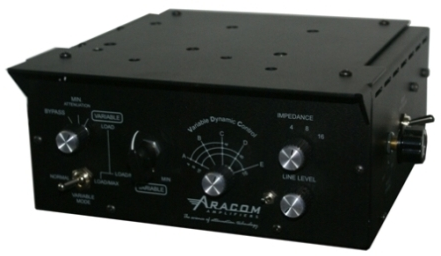 For more information, visit the Aracom DRX product page! Okay, not for a human, but for a pick, at least for me, it’s what I prefer. I use a Wegen Picks Fatone (fat-tone) pick, and at 5mm thick, it’s one fat pick. I’ve sung the praises of fat picks I’ve used in the past, but this one is special in that I use it for both acoustic and electric guitar; something I couldn’t do with other picks. In any case, last night I got a renewed appreciation for a fat pick because I actually left my Fatone at home. And not having enough time to set up for my gig and fetch it, I had to use the spare emergency pick I keep hidden in the piano at the restaurant. This is a medium Dunlop Tortex. Not a bad pick, as I used that very same pick for years until I discovered fat picks. Tonally, it didn’t sound bad, but I had gotten so used to playing with a fat pick that I couldn’t get comfortable with the Tortex. The main issue was holding on to the pick. With fat picks, contrary to what you initially might think, you actually hold the pick much lighter, and let the pick tip do the work. Also, fat picks just glide over the strings effortlessly. In contrast, I felt like the Tortex was getting “stuck” on the strings when I played. I eventually got used to it, but it was a huge adjustment for me. I was really missing my Fatone. I won’t be forgetting again!